You may have seen by now that we were party hosts for the Sofia The First Twitter party. We were sent one of each micro jewel playset to try out before and during the party. 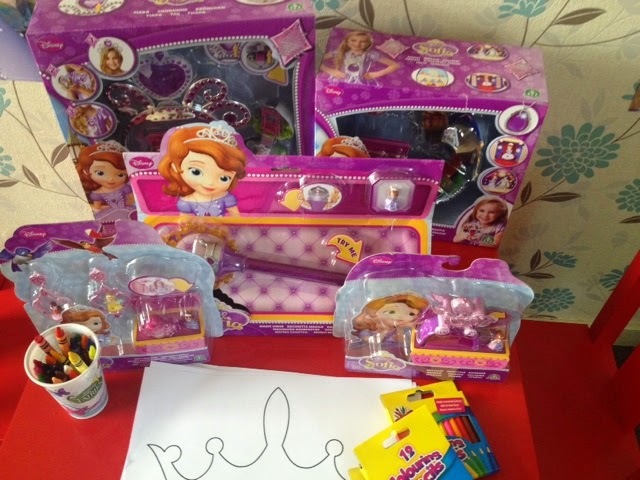 The playsets contain teeny tiny Sofia the First character dolls. The smallest and cheapest of all the sets but actually one of our favourites. The collection consists of three different bracelets to choose from. 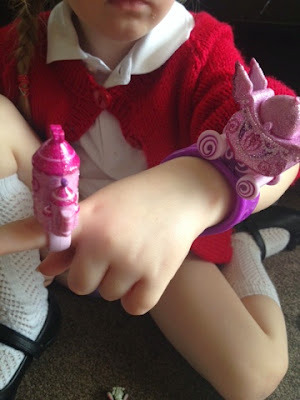 We got the pink carriage bracelet. 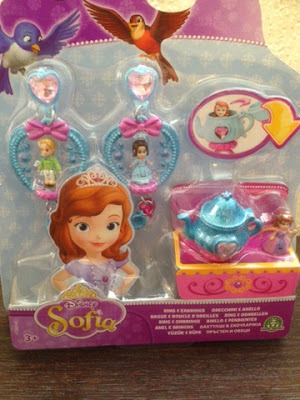 Open up the carriage to find a Sofia micro doll hiding inside. Gracie loved the fact that it opens up and so was like a secret hideaway for her to keep her micro doll. Again there are three different sets to choose from. The ring opens up like the bracelet does, to reveal a micro doll and the earrings each hold a micro doll in full view. We loved the earrings. We like that you can choose which characters you attach to them and Gracie especially liked that she could either have two different characters at once or she could use two Sofia's to make them matching earrings. Every little princess needs a tiara!! 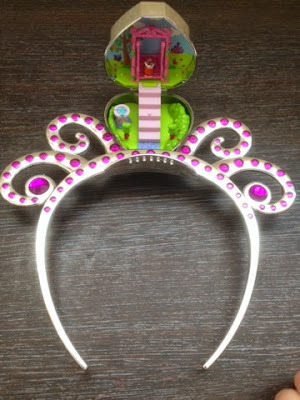 The tiara playset has a removable heart shaped gem that doubles up as a pendant when removed. The heart contains a little micro world with Sofia's castle garden and a moving swing for the dolls to play on. This set contains three micro dolls. I thought this was a lovely set. I like how it is multi functional and so will entertain the kids for much longer. I've heard some people have had trouble with the size of the Tiara but for us it was no problem as it fitted Gracie perfectly. This was by far our favourite set out of all of them. 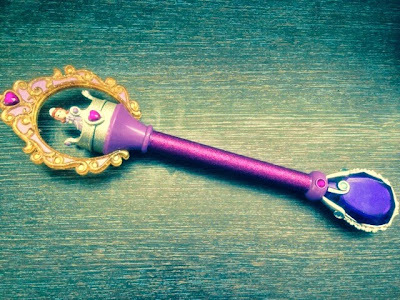 Both Gracie and Zach love the flashing lights and magical sounds made by the wand. The crown at the end of the wand opens up again to place in the Princess Sofia micro doll or alternatively she can stand on top of the crown where she can be seen. This set is definitely one I would buy as a gift for any little girl. Just like Sofia's magical amulet in the show, every little girl can own the famous jewel. 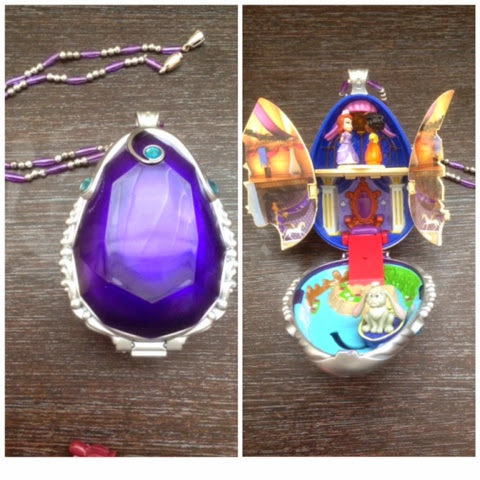 The amulet is even more special though as it also contains a micro version of the castle inside. It has three levels of the castle with moveable parts. This set contains three micro dolls and also has lights and sound effects and a spinning dance floor for the micro figures. Gracie loves this set. We did find it difficult to open the first few times but it eventually loosens a bit. I have to say though the lights don't work on ours, I'm not sure if it arrived like that as I didn't realise it was suppose to light up so it could possibly have been damaged by one of the kids.